NEWCOMER D’Fong Restaurant’s serves scrumptious Chinese cuisine with a modern twist. The restaurant is TA Enterprise Bhd’s first foray into the food and beverage sector. Diners would be delighted to know that chef Ng Heng Chew brings his own blend of flavours to ordinary Chinese dishes. While Chef Ng’s signature dishes may come across as typical, they taste anything but. One such example is the Creamy Sauce Lobster. Having your lobsters served in creamy sauce is nothing new. But the chef’s creamy sauce is flavoured with a dash of curry powder to excite the senses while enjoying the rich, silky cream that generously covers the crustacean flesh. The slight spiciness of the gravy makes the richness of the cream less overwhelming. It may take some by surprise. But once the taste has settled, the twist can turn out to be a pleasant surprise. Chef Ng, also known as Chef Tuck as he is more commonly known, noted that lobsters were usually either cheese-baked, cooked with butter sauce or served as sashimi. But he has put much thought into pairing curry powder with cream sauce and thinks they go well together. 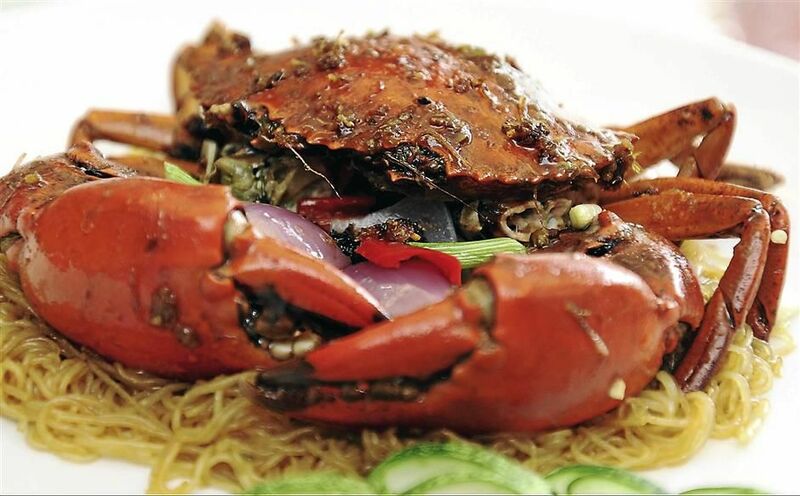 The braised Crab and Vermicelli with XO Sauce is another interesting dish with glass noodles as an added ingredient. Crab is another seafood that is often cheese-baked or served in chilli gravy. Chef Ng picked the XO Sauce simply because he likes savoury taste and it is one of his favourite ways of cooking crab. The dish has a nice burnt taste to it, similar to fried rice. Another of Chef Ng’s signature dishes is the Steamed Dragon Grouper in Hong Kong Fish Village Style. It looks like a simple steamed fish with garnishing, and tastes exactly how it looks. The fish is not actually steamed, but is, in fact, cooked in a claypot to preserve the flavour. Ng hopes to introduce a more varied way of preparing Chinese cuisine by pairing them with flavours and techniques that he himself would enjoy, so that diners will have a wider selection of dishes to choose from. Apart from ala carte dishes, D’Fong also serves a selection of dim sum which is available daily during lunch. On Saturday, Sunday and public holidays, dim sum is available from 8am to 2.30pm. While most of the dim sum choices are similar to what you get elsewhere, one of the standouts is the Steamed Fish Ball with Dried Mandarin. Another is the crispy Yam Ball, a personal favourite of TA managing director and chief executive officer Datin Alicia Tiah. D’Fong, which translates to “most fragrant” in English, is also a namesake of Tiah’s maiden name, Tan Kuay Fong. The TA Foundation will be hosting a Shanghai Night Charity Event at D’Fong Restaurant on Oct 25. The event is in aid of the National Stroke Association of Malaysia, which provides rehabilitation services for stroke survivors. Tiah hopes to raise at least RM50,000 from the event as guests dine 1930s Shanghai-style.